Bellamare homes for sale can be found in the Costa del Lago area, which is part of the luxurious Miromar Lakes waterfront resort community. The Bellamare neighborhood includes 20 single-family waterfront estate homes all constructed by preferred custom builders in the area. House plans available to current buyers include the Coventry II and the Miralago. Each of these stunning plans includes a host of conveniences and luxury amenities for you to enjoy that will maximize your comfort in the beautiful Miromar Lakes community. At over 3,500 square feet of living space, the Coventry II features 4 bedrooms, and 4 full and 1 half bath. Your family space includes a formal living room as well as a morning room and large family room off of the kitchen. The 3 car garage has a side entry for your convenience and comfort. 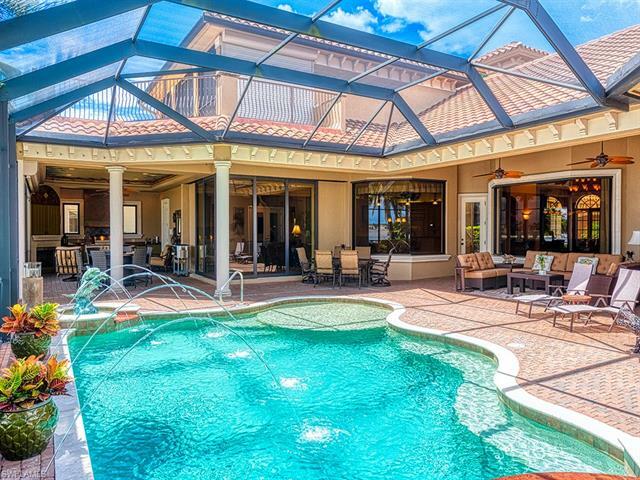 In addition, the Coventry II also features a covered lanai, beautiful 12 to 14 foot ceilings and the option to add a spa and/or fountain to the pool area as well. The Miralago is another beautiful estate home just waiting for you and your family. Offering over 4,300 square feet of living space, and an additional 1,000 square feet plus of additional space, including a garage and lanai, this 2 story luxury retreat features 4 bedrooms, 5 full and 1 half bath and a 2 or 3 car garage. An open floorplan encompasses the kitchen, dinette area and family room. Other convenient features and accommodations include a side entrance, open balcony on the second floor as well as a pool area. Either home will make looking at Bellamare homes for sale a real pleasure. One homesite remains for new construction. There are also resale opportunities that you can review below. Looking in Miromar? If so, Bellamare might be just what you want. As a Miromar home specialist, I have all the information you need to make that decision. Call me at 239-898-6865, or send an email to explore the possibilities.